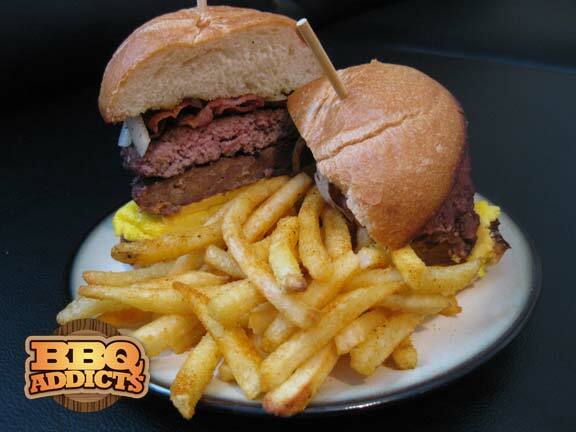 It may surprise you to know that the official Roethlisberger Sandwich is not actually a burger, but rather a loose meat sandwich. In my book that’s a cardinal sin, especially with “berger” in his name, so we’ll be pattying both the sausage and beef into 1/3 pound rounds to turn the Roethlisberger Sandwich into a true Roethlis-BURGER. In authentic pitmaster style, I seasoned my beef patties with a thin layer of brisket rub to add in a little extra BBQ flavor. You can do the same with the sausage patties, but I chose to let the intended spicy flavors shine through. 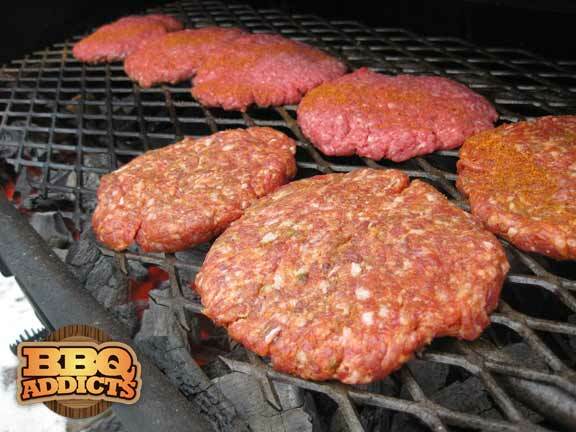 Toss the burgers on your favorite grill until they’re cooked to your liking. 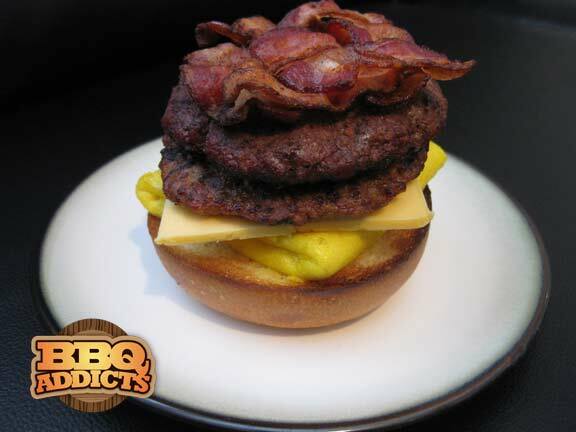 The next upgrade we’re bringing to the Roethlis-BURGER is the addition of a small bacon weave. 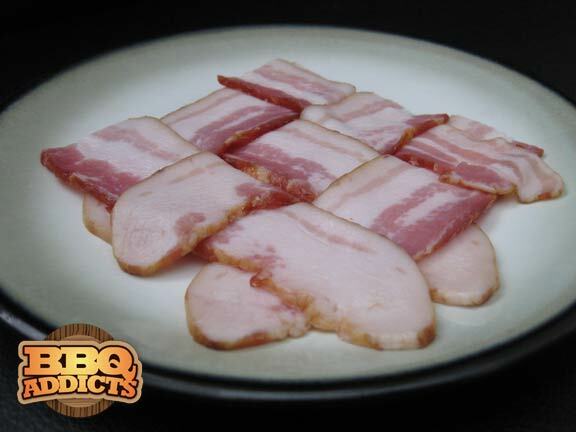 Cut three strips of bacon in half and make a tight 3×3 bacon weave. As many people have learned from trying the Bacon Explosion recipe, bacon grease and direct heat don’t mix. The grease drips down onto the coals causing flare ups, which ultimately results in your food catching on fire. So go ahead and fry this on the stove top while your patties are on the grill. It’s a shame to throw out perfectly good bacon grease, so toss in a few freshly sliced onion rings and saute until caramelized. 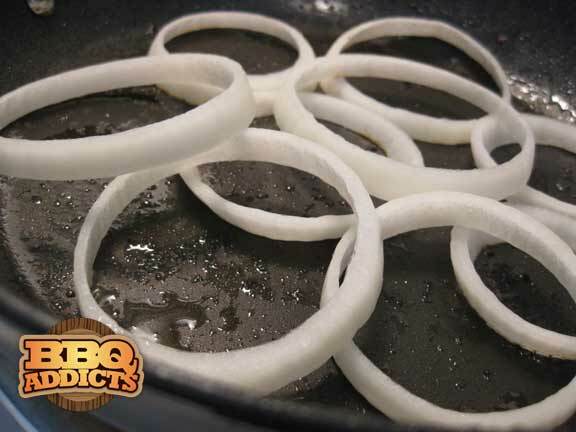 Once the onions are cooked to your liking, remove them from the skillet and set aside. While the skillet is still hot, pour in two beaten eggs. 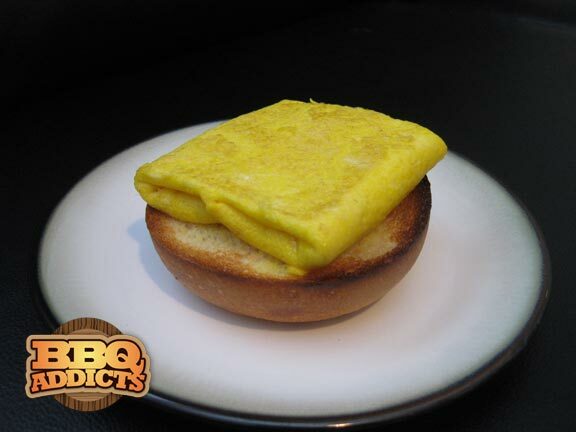 You’ll want to cook the eggs like you’re preparing an omelet, but give it a few extra folds so that it will fit nicely on the bun. Now that we’ve got all of the components prepared, it’s time to start assembling the Roethlis-BURGER. 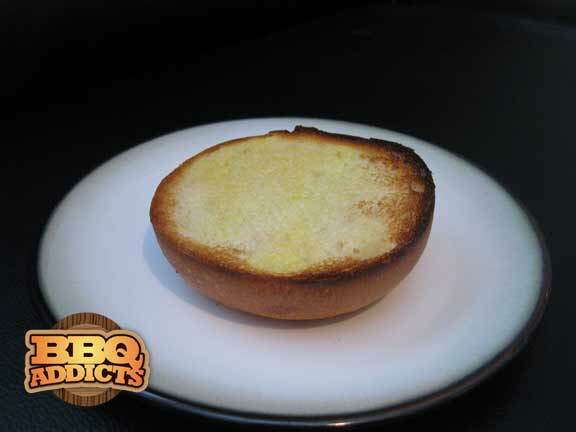 We’ll be starting off with a buttered and toasted kaiser bun. The traditional Roethlisberger Sandwich is served on a Portuguese roll, but the oblong shape isn’t very conducive to our burger patties. 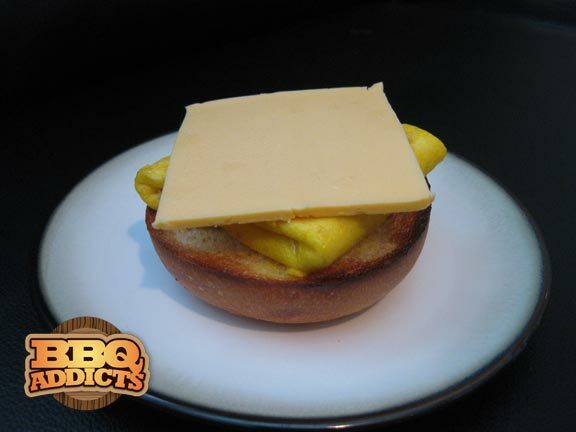 Next up, place the scrambled egg patty on top of the toasted kaiser bun. It’s worth noting that Peppi’s included scrambled eggs in their sandwich as a tribute to Big Ben’s ability to scramble when under pressure. Since Ben is an All-American guy, we’ll be placing a thick slice of creamy American cheese on top of the eggs. 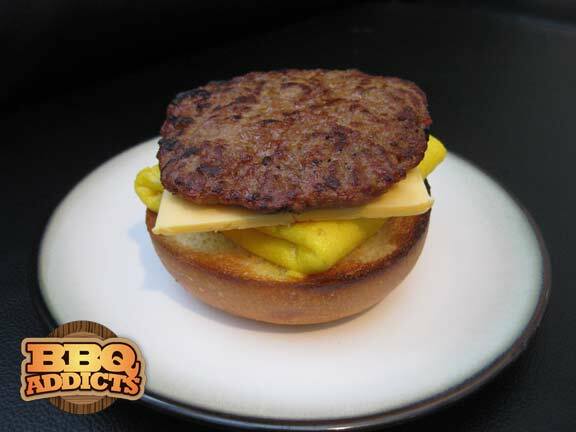 Now place a warm patty of spicy Italian sausage directly on top of the American cheese. I’m not too sure what inspired the use of sausage, so we’ll just chalk this one up to being damn delicious. 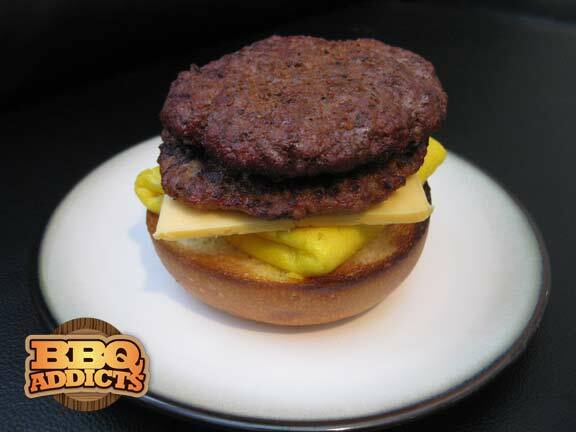 Place a juicy hamburger patty on top of sausage. Now round out the meat layer with the 3×3 bacon weave. And top the whole thing off with the bacon fried onion rings. Set the other half of the butter toasted kaiser bun on top, and the Roethlis-BURGER is now complete! Serve with a side of french fries seasoned with your favorite BBQ rub and you’ve got the perfect meal to help you cheer the Steelers on to victory this Sunday. Unless of course you’re a Cardinals fan…in which you’ll want to check back here tomorrow. See? Now the thing that makes that fattening is the bun. No, see, the real Pittsburgh way to do this is to add the fries on the sandwich, too. How to prepare the meat for the burger? Any instructions? @Susi – All we did was divide the raw hamburger meat into 1/3 pound sections and patty them down flat. They were then topped off with a little BBQ beef rub. The same goes for the sausage patties, sans the beef rub. Great looking burger! I started using brisket in my patties and it is turning out real well. I like your idea of mixing the sausage with hamburger…I’ll have to try that. That’s a good looking grill you have! Best to you! My name is Jeff Trebac and I created the Peppi’s version of the Roethlisburger. I see that you have commented that it is a sin to create it as a loose meat sandwich but the reason is twofold. One, my wife made me a creation that used similar ingredients and the meat portion was mixed together, therefore the flavors of the meat blended together. Two, when producing large quantities, the cooking time is definitely decreased when dicing the meat on the grill. The final product is one where you get all the flavors in one bite. When the idea came together, I foresaw it as a novelty item. Once perfected, it truly became a fantastic burger that is not a burger, which was kind of the idea. The Roethlisburger is a very unique combination that I have never seen produced before. When in Pittsburgh, come see me at our Northside location and I will make you a killer #7. Go Steelers…. @Jeff – I enjoy a loose meat sandwich as much as the next guy, but it’s hard not to go the patty route when your inspriation’s name acutally contains the word “berger”. 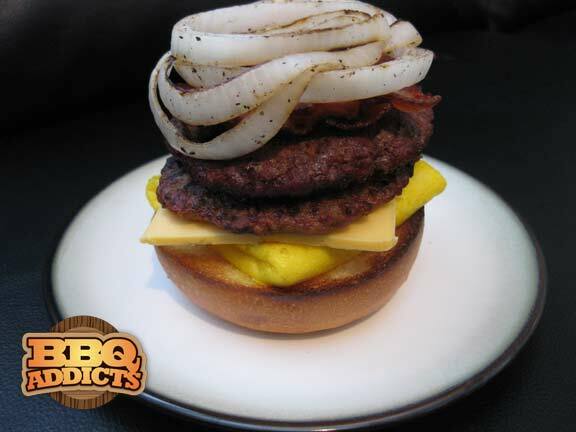 After concocting our version in the BBQ Addicts test kitchen, it was pretty obvious that you guys do this to save time. None the less, it gave us the perfect opportunity to put our own twist on your creation and pay homage to the now Super Bowl Champion Steelers! We’ll swing by the next time we’re in the neighborhood and enjoy the original #7. Yo, be careful when eatin dis, it might attack your digestion system and leave you screamin in da bathroom. Been dere, done dat. 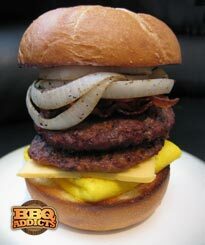 omg I have to try this burger on the next football sunday. It looks like is so good and filling. Thank you for sharing this with us. Why are you guys crawing heart diseases, premature aging and a shortened life? Looks delicious, but I’m a little disappointed that it’s wearing a helmet. loose meat is the way to go with this! I have had the original and this copycat… the flavor of the original takes the prize!